Do you want to save money on your monthly water heating bill? Reliable Plumbing & Heating Services wants you to meet the newest water heater on the market: the tankless water heater, which heats water on demand – meaning you don’t pay for hot water you don’t use. The tankless water heater works by using an electric element or gas burner to heat the water as it travels through the pipe, instead of using pre-stored hot water. Instead of paying for a tank of water to be kept permanently hot, you’ll only pay when you actually use the hot water. This can equal savings of anywhere from 27% to 50% on your monthly energy bills, especially if you install a tankless water heater at every hot water outlet in your home. We install Energy Star-qualified equipment to guarantee even greater energy savings. Tankless water heaters can avoid the heat losses often experienced with standard storage water heaters. Proper installation of a tankless water heater can optimize its energy efficiency and heating capabilities, guaranteeing your water heater satisfaction for years to come. 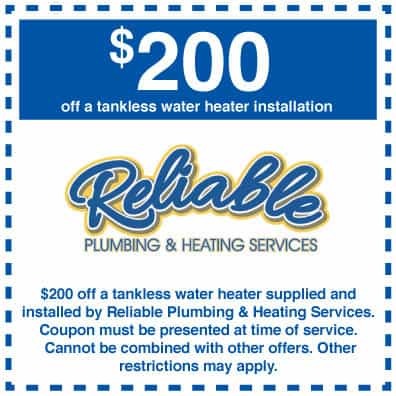 For more information about tankless water heaters, and to get a professional evaluation of how much money it can save you, call Reliable Plumbing & Heating Services at (831) 394-7077 today.